Virtual Potluck is working with Savory Spice Shop this week, and I couldn't be more pleased. Besides the fact that I have a serious spice addiction, Savory is a local company. Or at least it started locally. Now, there are stores opening all over the country. And of course, you can also buy spices online from them. Each of the Virtual Potluck bloggers is working with spices from a different section of the store. When I looked at all of the sections, I realized that I had favorite products in every one, so it didn't really matter to me which section I'd end up with. I browsed through the list of products in those sections, and picked a few of the dip and dressing mixes, and I also picked up some of my favorite items - the cheese powders. Yep, cheese powder. Powdered cheese. It's cheese with all the liquid removed, so you get all the flavor in a shelf-stable and very convenient product. And then I got a really interesting type of pepper. Before I get to the recipes I made, let me entice you a little bit. 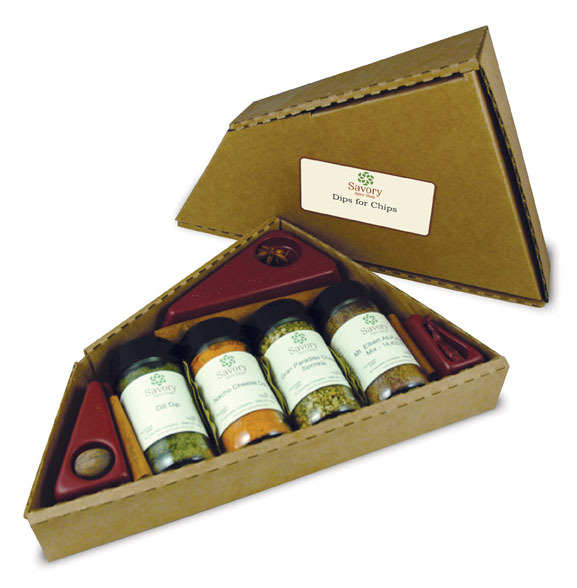 As part of this promotion, I've got a gift set called Dips for Chips that includes some of the custom blends from Savory Spice Shop. It's a pretty sweet gift. Instructions for entering to win that gift set is at the bottom of this post. And don't forget that all the other bloggers participating in this event also are giving away spices. Check the post here for the complete list of bloggers and a preview of what they're giving away. Just because a spice mix says it's for dips and dressings, it doesn't mean that it has to stay that way. While these blends would be great on your salad or for a dip, they don't have any strange ingredients that would keep you from using them elsewhere. The dill dip, for example, would have worked really well added to mayonnaise to make a sauce for fish. Instead, I skipped the middleman (bye-bye, mayo) and applied the mix directly to the fish. Not only did it add the great dill flavor to the fish, it also added color to an otherwise pale fish. Sprinkle the Dill Dip on the fish - both sides. If your fillets are large or you prefer to use more Dill Dip, feel free to be as generous as you like. Heat the butter and oil in a saute pan on medium heat. (If you prefer all oil or all butter, that's fine; I prefer the combination). When the butter has melted, add the fillets to the pan. Cook until the fish is cooked about halfway through. Flip the fish over and cook on the other side until the fish is just cooked through. Serve hot with lemon wedges on the side. I served it on top of shredded radicchio - I thought the color was spectacular. A little cabbage slaw with a lemony-vinegar dressing would be great as well. And, hey, how about some biscuits to go with the fish? I used a Romano cheese powder in the biscuits, and added my new find - Tasmanian Pepper Berries - on top. I thought an herbed butter would make a nice companion for the biscuits. Line a baking sheet with parchment paper and preheat the oven to 450 degrees. Combine the flour, baking powder, cheese powder, salt, and sugar in a medium bowl. Add the butter to the bowl and cut it in with a pastry cutter or two knives until the pieces are no larger than a pea. Add the milk and stir gently until all the flour is moistened. The measuring cup will have a few drops of milk remaining - hang onto that cup - you'll use that remaining milk. Flour your work surface and turn out the dough. Flour the top of the dough. Knead the dough briefly by folding it over itself and pressing down gently, until the dough comes together as a coherent mass. For the first few folds, it's easier to use a bench scraper to lift and fold the dough. 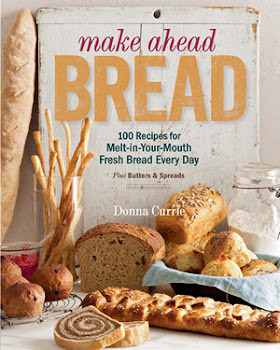 Add more flour if the dough is too wet, but avoid adding so much that the dough becomes stiff - it should be soft dough. Roll the dough to a thickness of about 3/4 inch. Cut out biscuits using a biscuit cutter. Place the biscuits on the baking sheet. If you want biscuits that are crisp all the way around, leave them separated. If you prefer soft sides, arrange the biscuits so their sides are just barely touching. Re-roll any scraps remaining from cutting out the biscuits and cut more biscuits. I usually take the remaining scraps from second cutting, mash them into a lumpy biscuit, and bake that along with the rest. Somehow no one ever sees that biscuit. Hmmmm... I wonder why... I mean, really, you have to do some quality control tasting. Brush the tops of the biscuits with the remaining milk. Sprinkle the top of the biscuits with some of the ground pepper berries. Bake the biscuits at 450 degrees until they are nicely browned, about 12 minutes. I made just a little bit of this butter, but you can make as much as you need. This butter would also be great added to cooked rice or pasta, or on potatoes or vegetables. Combine the butter and the Parmesan Pesto Sprinkle in a small bowl, mixing thoroughly to distribute the herbs throughout the butter. Refrigerate it, if you won't be using it in an hour or so. This is best if it's made at least an hour ahead, which gives the herbs a little time to hydrate and soften, so the texture is better and the flavor is a little more pronounced. I'm giving away the Dips for Chips gift set, just like the one in the photo below. You want it, right? The gift box includes the same dill dip I used for the fish, nacho cheese dip (ooh, I love the cheesy dips), Gran Paradiso Parmesan Cheese Sprinkle, and Mt. Elbert All-Purpose Seasoning (named after the highest peak in Colorado). Along with the spices in jars, you get a few little surprises, including a whole nutmeg and some cinnamon sticks. If you've never used fresh ground nutmeg, you're going to be surprised at how good it is! For the first entry, go to the Savory Spice Shop page on Facebook, and click the Virtual Potluck icon (you might need to like them first) to find a complete list of all the herbs, spices, and blends that Savory carries. Find the sections I worked on (Dips and Dressings / Peppercorns) and pick out any item you think you'd like to try from that list. Come back here and leave a comment here telling me what you picked. If you want to tell me how you'd use it, that's cool, too. For a second entry, follow me (@dbcurrie) and Savory Spice Shop (@SavorySpiceShop) on Twitter and tweet a link to this contest. Come back here and leave a comment telling me that you tweeted. For a third entry, pin a photo from this post on Pinterest. Come back here and leave a comment telling me that you pinned. For a fourth entry, stumble this post. Come back here and leave a comment telling me that you stumbled. For a fifth entry, go to this post, find another Virtual Potluck blogger whose recipe looks good to you, and come back here and tell me who it is. There ya go. Five possible ways to enter for some really awesome spices. And a lot more blogs to go look at and try to win! This is open to people with US mailing addresses only. Contest opens as soon as this posts, and ends on Friday, April 20 at midnight, mountain time.